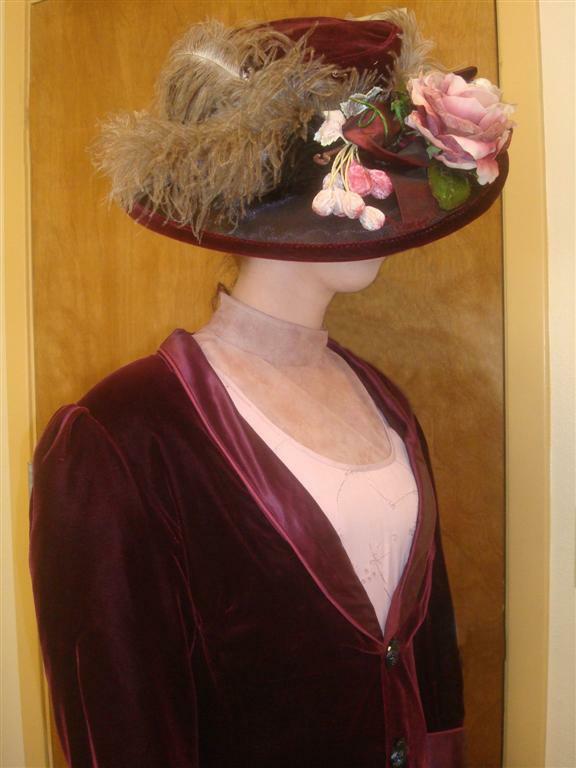 On November6th, our church put on a Ladies' Victorian Tea again this year. 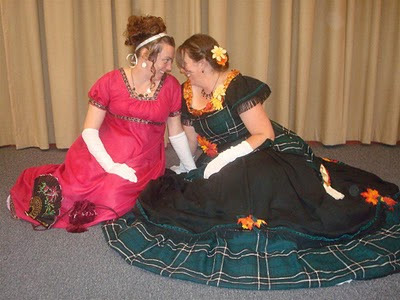 The theme this year was "The Womanly Arts." Lady Carolyn did a wonderful presentation on the things women did through the ages to keep themselves busy and entertained. Many of it had to do with sewing, knitting, etc. The ladies of our church provided the food, decorations, and venue. 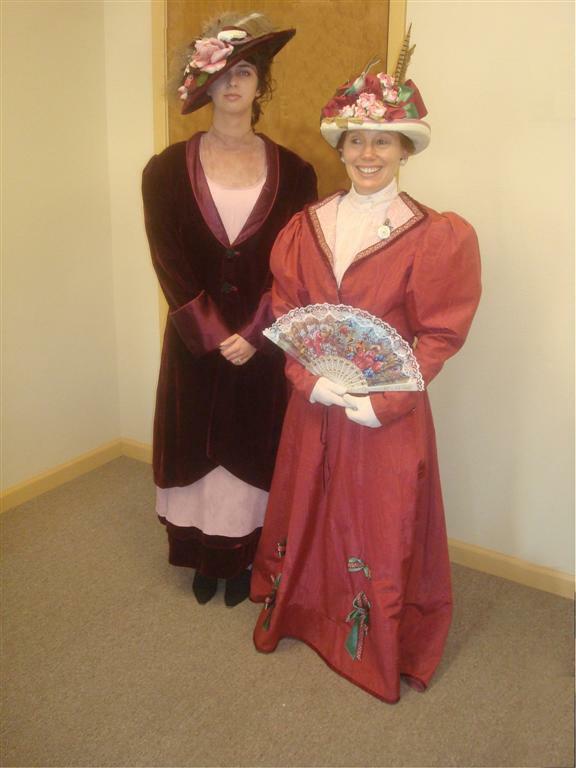 Lady Carolyn presented the talk and coordinated the other presenters, and I outfitted those ladies who did not have costumes of their own. The presenters wore costumes that fit with the time period of the art they were presenting. Voila! Nice and easy, but elegant for my evening dress. The ladies whom I outfitted are not experienced costumers, so I had to help with their hair. 1550's Renaissance - she presented knitting which was very popular in that time period. 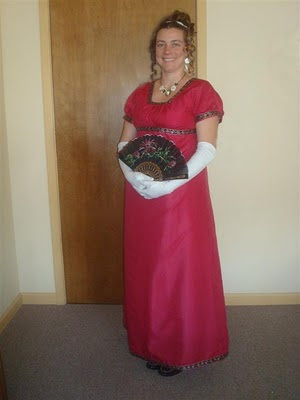 1810's Regency (Jane Austen) - She presented crocheting which started right about that time period. 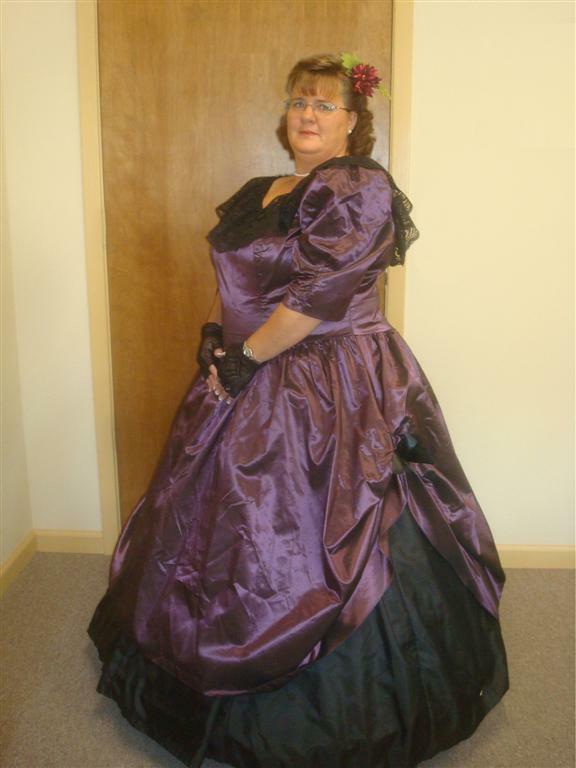 1860's (Civil War) evening gown - she presented counted needlepoint. It wasn't until the middle of the 19th century that counted needlepoint came into being. 1910's (Titanic) - she presented writing, which was a large pastime for women up until telephones became accessible to everyone. I just love those big hats! 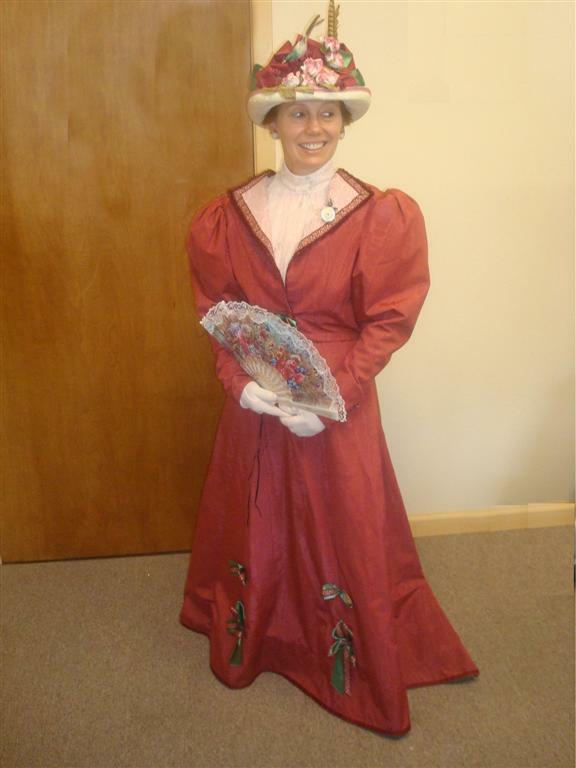 1895 walking suit - she presented reading - which is still popular today, but not as mush so as it was in the pre-television era. 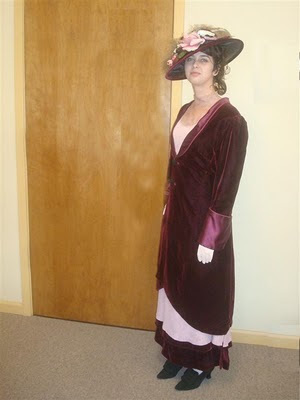 My daughter in her 1860's outfit, which is almost too small for her now. 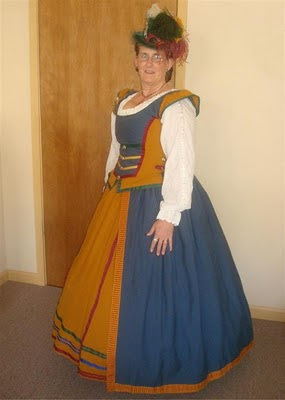 A presenter in her own 1700's garb presenting drawing. Another presenter in her own garb, this from the 1500's, presenting how to make bobbin lace. My daughter was entranced by the writing process. Making use of the fans we provided for the guests. Lady Carolyn giving last minute instructions to the other presenters. When you gotta, you gotta - adjust your drawers that is. Unfortunately, I did not get any pictures of the guests (which there were not many of) or of Lady Carolyn's presentation. But we did have some fun afterward taking more pictures after the guests went on their way. Lady Carolyn disrobed so that she could help tear down the equipment. But, Lady Carolyn was just a tad too short, so, her daughter (ie me), who is 4 inches taller, got roped into duty. What? 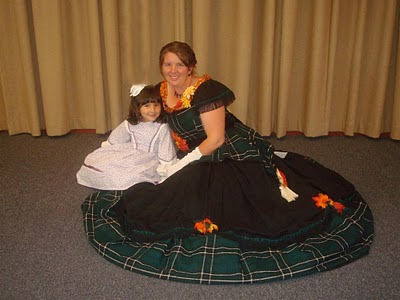 You don't think those Victorian ladies let a little thing like a huge hoop skirt stop them, do you? I think not! My daughter was fascinated by what my hoops looked like from the underneath. Myself and my best friend. What's that under there? Could it be...? Yep, that's right. I felt a bit like Mother Ginger from the Nutcracker ballet. A good exit was just as important as a good entrance to the Victorians (and probably others throughout history). So it's always a good idea to know what the back of your dress looks like. So, I guess this is goodbye, till next time!